I found myself turning into Jan-Arne this morning. At least… I didn’t suddenly find myself with a shaven head, sporting a beard and infectious giggle, but I did drop my trousers on the floor. They shocked me by leaping out of the corner when I went back to check whether the washing machine had finished, half an hour into my shift. I confess I was distracted on my arrival at work, firstly by a broken mirror in the car-park, then by the sight of a small muculent mess by the door. Such slimy treasures are not such an unusual finding outside a veterinary practice, but obviously it needed to be cleaned up. As I was juggling the twin thoughts that I needed a brush and shovel and a bucket of water, I was further disturbed by the realisation that I had taken the last large pair of trousers from the pile. I pulled them on with a slight feeling of guilt that I might be depriving others of their comfort, but still couldn’t bring myself to shoehorn my thighs into a medium pair. It was this action that prompted the return to the changing room where the washing machine lives. As usual, the ever efficient Jacqueline had been there before me and a new load of washing was chugging round as the first lot pelted around the drier. Returning into the fray, I came upon Marita and Jacqueline lurking suspiciously in the lab. I was able to diagnose an escaped patient, and from their relative positions, I was also able to deduce the escapee was currently underneath the sink cupboard. Happily within a moment they had retrieved the animal, which turned out to be a small, very sweet-looking cat, the first of the day’s tabbies. Having joined in with the hunt, I was happy to help Marita as she went on to spay the cat, followed by the spay of its sister, which was another tabby. Marita is getting very efficient with her cat spays. In no time at all, she had finished both, in spite of the fact that the second was a slightly more complicated operation than usual. In fact, she was perhaps a little too efficient with the first one. As I was cleaning up the second, she went and injected the first little cat with the antidote to the sedative. It was only then that we realised that we had to put a buster-collar on her. Despite the fact that she was obviously rather flighty (as demonstrated by her excursion under the cupboards), I hadn’t seen any suggestion that she was vicious, and so I decided to make a solo attempt. It soon became obvious this wasn’t going to work. Just getting her out of her cage was difficult. Calling for Marita’s help, I struggled to get her to keep still. She wasn’t nasty. She wasn’t showing signs of anger, or trying to bite. She was just really wriggly. And she really didn’t want a buster collar on. I was most impressed with the way Marita slipped the thing into place. It always amazes me how efficient vets become at some rather unusual tasks. I was dismayed to see a pool of blood appear on the floor however, and as soon as the buster-collar was in place, I lifted her up to inspect her wound. Indeed it was. Crazy as it sounds, I too felt relief. Far simpler to wash a couple of scratches than to re-sedate a patient, maybe have to open her back up to satisfy ourselves she wasn’t losing blood internally. My day of tabbies continued with Tommy and Britney. Tommy was feeling a bit under the weather, whereas Britney was feeling much better, having seen Jan-Arne yesterday. The flood of tabbies was only interspersed with one small pug, who didn’t quite fit the pattern, but was nonetheless adorable. And my final tabby of the day was Lille Pus, who is pictured at the top of the page. How beautiful she is with those piercing yellow eyes. She was actually Jan Arne’s case, in for a spay, but Britney had been so much better than expected, that I had some time to spare and so I was able to give him a hand. And then my work was over, and as I went out to my car (for once actually on time) I realised that I had never managed to find the brush and shovel to remove the broken mirror from the car- park. Luckily Irene, fount of all knowledge about where everything is kept, located it tucked away in the large animal section of the practice. Of course, never one to shy way away from some fun cleaning, she accompanied me out and I ended the day dancing around, picking up bits of glass on the Tarmac with Irene as the rain drummed down. There’s never a dull moment in veterinary practice. “Buster collar”? That’s a new term for me, what behaviour does it surpress/encourage, and how? Hi Penny. A buster collar is a plastic collar that stops animals from licking their surgical sites and potentially pulling out their stitches. 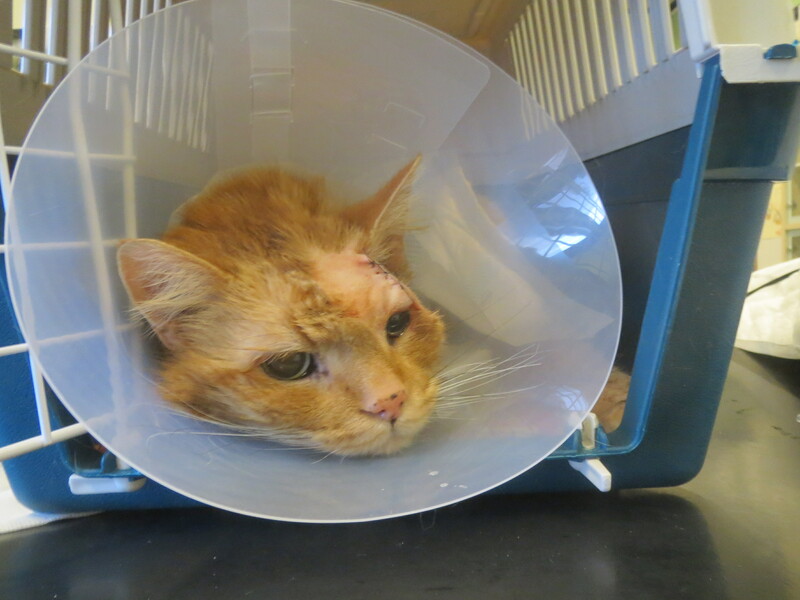 I have added a picture of Tøffen wearing one above, when he was about to go home.